Fillings are one of the most common dental treatments around, with most patients needing at least one filling in their life. The UK still has a very high rate of tooth decay, and while we are advocates or preventative dentistry, stopping problems such as decay and gum disease before they start with a stringent home hygiene regime and regular visits to the dentist or hygienist, we also offer white fillings to patients who have suffered decay. Once, when you needed a filling, the only option available was metal amalgam fillings. These are very strong and durable and serve their purpose well, but are also very noticeable because of their metallic grey or silvery colouring, making them very obvious – particularly if they are at the front of your mouth. White fillings have been around for many years, but were for a long time considered to be less strong than metal amalgam fillings. 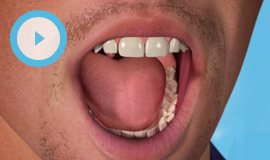 However, advances in techniques and materials in recent years now mean that white fillings are now considered to be almost as strong as metal ones, and suitable for use anywhere in the mouth. Although they are known as "white" fillings, a more accurate name is "tooth-coloured" fillings, because the material used can be closely colour-matched to the natural shade of your teeth, meaning the fillings blend in perfectly and nobody will know they are there. White or tooth-coloured fillings are made of a strong composite resin material that is carefully shaped to fill a prepared area of your tooth. For very large white fillings, tooth-coloured inlays or onlays may be used instead. If you need a filling, your dentist will first remove all areas of decay and will shape your tooth to receive the filling. This is carried out under local anaesthetic, so you won't experience any pain. The filling is then placed, and the material hardens quickly once in contact with your tooth. White fillings purely for cosmetic reasons are not avaliable on the NHS. It is also possible to replace old, worn, metal amalgam fillings with white fillings – please speak to your dentist if you are interested in having old fillings replaced.